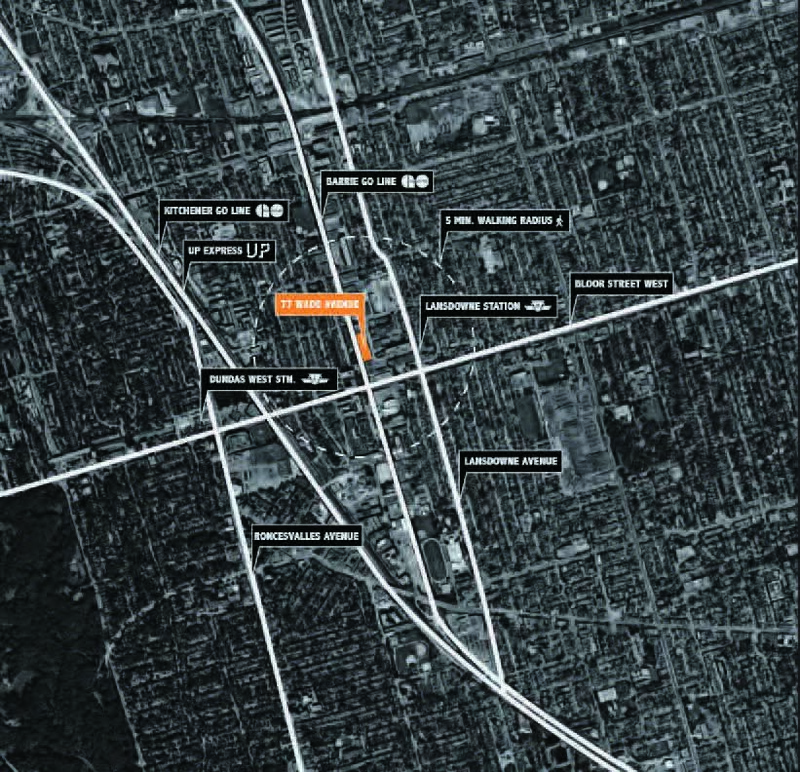 Located in Toronto’s Junction, 77 Wade Avenue will be a purpose designed and built office with collaboration space for the new digital age industrial worker. 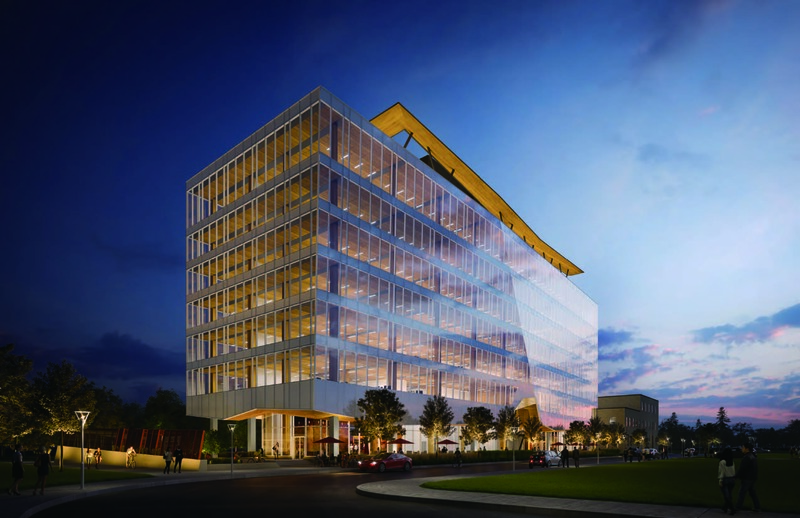 At 8 storeys (as defined by OBC) and approximately 150,000 sf, 77 Wade Avenue will be the tallest modern mass timber office and commercial building in Canada that is targeting LEED Gold. The key design intent of this project was to fuse contrasting materials to enhance the inherent warmth of an exposed wood structure comprised of composite mass timber, concrete and steel structural assemblies. 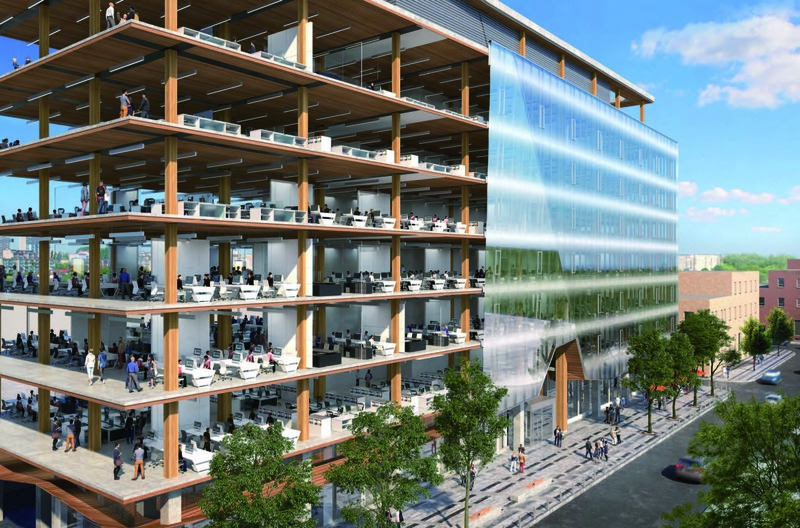 Unlike the construction of 20th century post and beam buildings, construction of 77 Wade optimizes the use of a masstimber hybrid structural system by way of pre-fabricated components and just-in-time delivery and construction practices to achieve spans akin to traditional concrete and steel superstructure projects for modern commercial office buildings. The overall design celebrates the advanced use of mass-timber construction within the ever-evolving architecture of Canada. 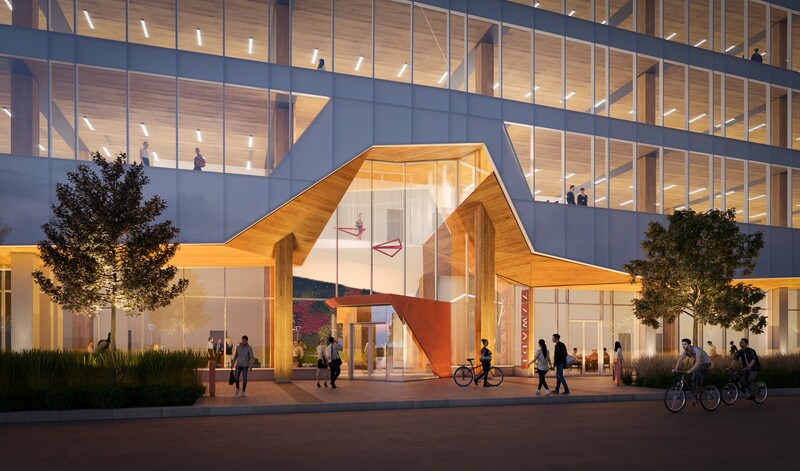 The development and design of 77 Wade maximizes and streamlines the inherent structural and aesthetic qualities of exposed wood construction in a new and modern way; ultimately showcasing both our Canadian talent pool and our renewable wood resource. The building’s envelope will predominately be clad in a folded plain curtain wall to expose the innovative structure within, while also adding a dynamic form for the streetscape. The approach to the building is unified with an origami based geometric soffit and organic front entrance, retail and flexible collaboration spaces. adjacent and elevated GO Barrie line corridor to be constructed complete with a linear park and Multi-Use Trail below (aka Metrolinx’s “Davenport Diamond” project). Today, tech-oriented and innovative companies desire work environments that hum with architectural character. 77 Wade achieves this with the use of wood construction and the fusion of contrasting materials. The provision of communal spaces for both the building’s users and the public, paralleled with the use of appropriate landscape design and softer and transparent cladding materials, makes 77 Wade Avenue a state-of-the-art contemporary office building that addresses the City and its’ urban citizens with a unique and innovative architectural language. Thoughtfully integrated into the transit oriented context, the design focuses on making the building accessible to commuters in a number of sustainable and different ways. These include easy access by foot, bike, TTC subway and bus as well as regional rail, with less emphasis on private cars. Adjacent to the site lies the Davenport Diamond Multi-Use Trail. The 77 Wade design proposes a pedestrian and bicycle link across the south end of the site. This facilitates a connection between Wade Avenue, the Multi Use Trail and the City at large. The multi- use trail will also feature an underpass connection at Paton Road to Erwin Krickhahn Park, which will further connect the 77 Wade Avenue users to larger scale green space. As a response to the adjacent public streetscape, a boulevard lined with foliage is proposed along Wade Avenue. At the ground level, the building face is recessed back to create a more spacious pedestrian realm, accented by a change in materiality overhead with the implementation of a wood soffit. Here, the overhead wood soffi t makes for a dynamic and inviting streetscape at a pedestrian scale. This expression of wood on the exterior is again reinforced by its use on the rooftop canopy, encircling the rooftop amenity space and visible from all directions around the site. To create a more pedestrian friendly environment on the rail and north sides of the site, an innovative solution was adopted by designing a sunken parking and loading area to mitigate the visual impact of building services. The Client’s primary objective is to create a character driven built form that is modern, yet reminiscent of the openness, lightness, using materials of traditional multi-storey warehouse loft buildings. In considering the context, the design of the building was developed to be experienced from all four sides; from Wade Avenue, from the south urban garden in the background from Bloor Street, and from the Davenport Diamond Multi-Use Trail and adjacent GO commuter rail lines. This created the need for a minimal and pure, yet dynamic massing approach with a unified expression from all viewpoints. The angled fold of the curtain wall along the Wade Avenue façade engages with the movement of the sun, with one side appearing transparent and the other appearing opaque depending on the angle of reflection. It also clearly demarcates the entryway since the fold line extends into the Lobby space. To reflect the elongated rectangular form of the site, the massing spans 80 metres along Wade Avenue and only 24 metres deep into the site. Instead of a condensed core typical of most office floor plates, the services are extended along a linear strip with a central throughway to connect the west and east sides of the core, intended to maximize natural light penetration for the occupants. At the ground level, the uses within have been configured to permit ancillary retail to the north of the lobby, collaboration space to the south, which then opens up onto the adjacent privately owned public space urban garden. This physical organization and distribution of spaces helps creates a seamless movement from public to semi-public to private spaces, all while reinforcing a focus on the use of the unique built forms and materials. 77 Wade Avenue presents the opportunity to innovatively fuse design concept, material use and building systems to generate a built form that speaks to the unique treatment of each of these elements. Timber, steel, and a concrete hybrid structural system are all used to achieve this objective. Wood columns and exposed Nail Laminated Timber (NLT) decks are used to showcase the use of wood. In most heavy timber construction, a large portion of the structure is covered by gypsum wall board to achieve mandatory fire ratings. Early in the project, structural and fire code research was conducted to achieve the optimal use of wood as a significant structural AND finishing material but without having to compromise on the extent of its exposure. 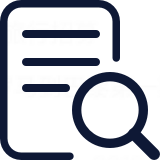 Through this research, the firm was able to propose an innovative method addressing all building and fire code requirements that ensured the majority of the wood was not required to be covered or hidden by fire-rated materials. 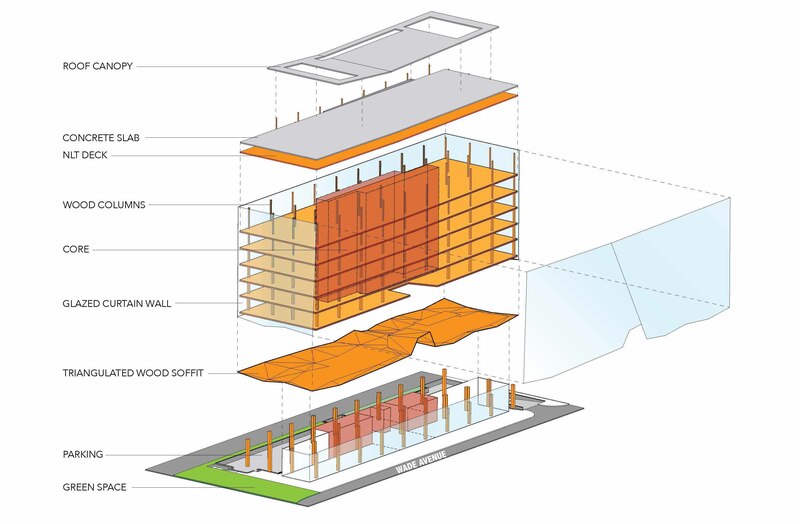 On the Wade Avenue elevation, the wood soffit folds to add a layer of dynamism at a pedestrian scale while simultaneously gesturing to the central lobby as a wayfinding technique. By bringing wood to the exterior faces of the building offers a glimpse to the interior character of the building and successfully ties the interior with the exterior. A high performance glass curtain wall with a ceramic frit pattern to minimize heat gain was introduced to the façade of the building. Shadow box spandrel glazing was added to introduce a layer of depth and shadow to the assembly. The frit and spandrel are proportioned in a manner that ensures a high level of internal privacy while still being able to see the NLT ceiling from the exterior. 77 Wade Avenue celebrates the wood and showcases the steel beams and connections and remains true to creating an industrial aesthetic with a modern and naturally lighted warehouse character. 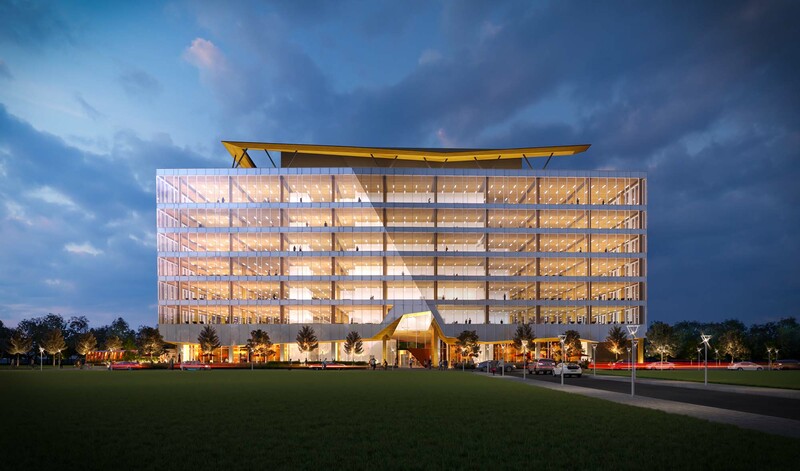 The building is designed understanding the needs of the contemporary office worker with access to sustainable methods of transit, outdoor amenity spaces and urban spaces for a healthier work environment, and collaboration spaces where they can interact informally with co-workers. Keeping the site context and the larger urban context in mind, 77 Wade is designed to seamlessly merge the inside with the outside. Though the building is a private office space, the firm intentionally proposed a privately owned public open space at grade level. By extending connections to existing adjacent urban spaces as well as providing semi-public open spaces of its own, 77 Wade is a building design that merges effortlessly with its surroundings. The project underwent an energy modelling exercise from which building systems were selected on the basis of energy efficiency and optimization. 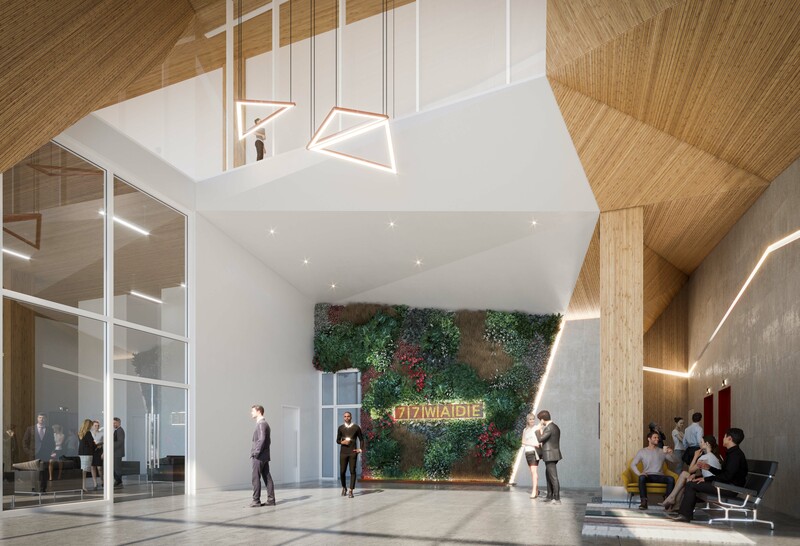 Sustainably sourced timber, green roof implementation and green construction practices are proposed to introduce sustainable design elements into 77 Wade Avenue. Additionally, by providing secure and sheltered bicycle facilities, encouragement of use of the Davenport Diamond trial through physical pedestrian connections, and the provision of change and shower room facilities, the design reinforces sustainable practices such as alternative transit modes such as walking and biking.